I'm watching some of the R&B Committee coverage on C-SPAN and Senator Levin is trying his hand at some revisionist history by trying to turn the table on New Hampshire. At issue: New Hampshire jumped from its original date of January 22 to January 8 but was granted a waiver by the Democratic Party to do so. In so doing, they jumped Nevada's caucus. Levin took issue with that decision because Michigan wasn't granted a waiver for their jump. He cited the sequence that the R&B decided on--wedging a caucus in between Iowa and New Hampshire--as being the real topic for discussion. New Hampshire's move was contrary to that sequence. What Levin failed to mention in his plea to the members of the committee was that it was Michigan that triggered the New Hampshire move. New Hampshire has already been given the right to be in the pre-window period. The committee basically ruled that there was no harm, no foul in New Hampshire's January 8 position. The good people of Michigan apparently object though. Will Kennedy's Diagnosis Hurt McCain? I'm not one to simply regurgitate news. However, on this day when the DNC is set to potentially decide the fate, not to mention the make up, of the Florida and Michigan delegations to the Democratic National Convention, the Minneapolis Star-Tribune has a great timeline of events that led to this unprecedented meeting of the Rules and Bylaws Committee. July 22: The Democratic Party's Rules and Bylaws Committee recommends to the DNC that a Nevada caucus be held in 2008 between Iowa's Jan. 14 caucus and New Hampshire's Jan. 22 primary. The committee also suggests that South Carolina have an early primary after New Hampshire's and that other states cannot hold their contests before Feb. 5. Aug. 19: The DNC approves the committee's recommendations and penalties against presidential candidates who campaign in states that cut in line. Candidates would be denied delegates from those contests. Jan. 23: Florida lawmakers introduce legislation to move the date of the state's 2008 primary from March 4 to Jan. 29. April 5: The two leaders of the rules committee notify the Florida congressional delegation about the penalties for states that violate the timing of primaries. May 21: Florida Gov. Charlie Crist signs a bill moving the state's presidential primary to Jan. 29, 2008. July-early August: In discussions with the Florida Democratic officials, the DNC offers to pay about $880,000 for a state party-run caucus. Aug. 25: The rules committee decides to strip Florida of its 210 presidential convention delegates. It gives the state party 30 days to comply with rules by moving its contest back at least seven days. Aug. 30: The Michigan Legislature sends a bill to the governor setting the state's 2008 presidential primary for Jan. 15. Aug. 31: Democratic presidential candidates Bill Richardson, Chris Dodd and Joe Biden pledge not to campaign in states that hold early nominating contests in violation of party rules. The pledge is circulated by Democratic leaders of the early-voting states — Iowa, Nevada, New Hampshire and South Carolina. Sept. 1: Hillary Rodham Clinton, Barack Obama and John Edwards also sign on to a pledge to skip states that break party rules by holding early primaries. Sept. 4: Michigan Gov. Jennifer Granholm signs a bill moving Michigan's presidential contests to Jan. 15, 2008. Oct. 9: Democratic presidential candidates Obama, John Edwards and Bill Richardson file paperwork to withdraw from the Michigan ballot. Joe Biden and Dennis Kucinich say in statements that they also were bypassing the primary. Chris Dodd and Clinton say their names will remain on the ballots. Dec. 1: Democratic leaders strip Michigan of all its 156 delegates for scheduling an earlier-than-allowed primary. Jan. 15: Michigan holds its primary; Clinton wins. Jan. 29: Florida holds its primary; Clinton wins. March 17: Facing strong opposition, Florida Democrats abandon plans to hold a do-over presidential primary with a mail-in vote. April 4: The executive committee of the Michigan Democratic Party says "it is not practical" to conduct a party-run primary or caucus as a way to get the state's delegates seated at the Denver convention. April 25: The leaders of the rules committee sends members a memo announcing a meeting on May 31 about the disputed Florida and Michigan primaries. May 27: The Democratic Party's lawyers say the committee has the authority to seat some delegates from Michigan and Florida but not fully restore the two states as Clinton wants. Source: Associated Press, Democratic National Committee. The Florida and Michigan frontloading in 2008 is part of the progression of the general frontloading trend. It wasn't inevitable that either state would violate the "window rule" (period within which states could hold their nominating contests) of either party. In the post-reform era, states that wanted to move, moved to dates that fell within the window. The decision by the DNC to allow South Carolina and Nevada to move into the pre-window period, though, triggered a resumption of an age-old conflict in American history: small states vs. big states. So while the DNC's intent was to bring more diversity into the opening contests, they once again got some unintended consequences out of the changes (All you have to do is look at frontloading as an example of one of the DNC's post-reform, unintended consequences.). Why South Carolina and Nevada and not Michigan and Florida? 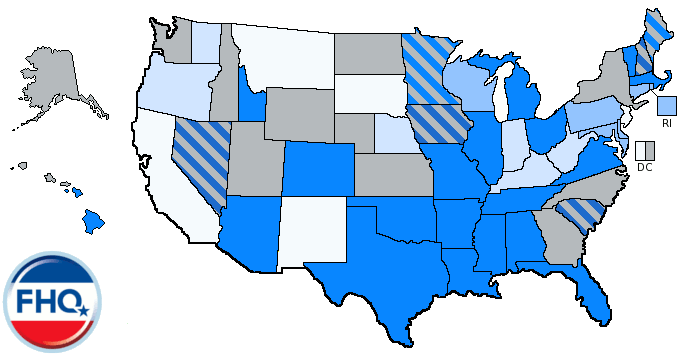 Of the ten states (Alabama, Arizona, Arkansas, Colorado, Hawaii, Michigan, Mississippi, Nevada, South Carolina and West Virginia) that petitioned the DNC to move ahead of the window's starting point, Michigan was by far the largest (Measuring by electoral votes, Michigan was the only state with more than 10.). Yet, the DNC opted for two smaller states to fill those spots. And that decision, along with Florida and Michigan's defiance of these rules, underscores another of the problems facing the various reform plans that have been proposed. Big states still will not be allowed to go first. And that is why today's meeting is so important. If the sanctions for moving ahead of the window are not upheld, what will hold states back from moving to whatever date they choose in the future (whether reforms are enacted or not)? Michigan certainly wouldn't have gone on January 15 if any of the reform plans (save the one in four chance that Michigan's region in the NASS regional primary plan was chosen to go first) were in place in 2008. The same motivation, therefore, would have been there for lawmakers in Michigan even in a reformed system. Will the sanctions stay or will they go? The educated guess is that half the delegates from Florida and Michigan will make it to the convention in Denver, but how will that half be determined and what effect would that have on the delegate counts for Clinton and Obama? This is probably about a week too late, but it's a question that's been floating around in my head recently that I've yet to see addressed anywhere. Ted Kennedy's ominous diagnosis last week underscores what is going to be a major issue in this presidential campaign: age. Rep. John Murtha (PA-D) has said McCain is too old, Howard Dean has said it won't be an issue and McCain himself has taken the self-deprecating route on his age. But like Nixon's five o'clock shadow during the televised debate against John Kennedy in 1960, the age difference between McCain and VANP (That's very almost nearly presumptive) Democratic nominee, Barack Obama, is going to be noticeable. Is that necessarily a bad thing for McCain? No, because on the one hand you have age, but on the other is experience. The former carries something of a negative connotation while the latter is more positive. When voters begin to see more of the contrast between Obama and McCain will that trigger thoughts on age or experience? Do they see a 76 year old politician diagnosed with a malignant brain tumor and project that onto a presidential candidate who would be 76 himself at the tail end of his first term as president? Or do voters see an experience gap between the two (Obama playing the naive role and McCain the role of someone who has been around the block a time or two)? I suspect that this may vary based on party identification: Democrats see an old man in McCain while those on the right see an experienced candidate and a "reckless" younger candidate. But what do those independents think when they see that contrast? Where they fall will more than likely tip the balance toward age or experience emerging as the dominant view. As we've seen throughout the Democratic primaries, though, a person's age has a lot to do with this as well. Older voters have gravitated toward Clinton while younger voters have overwhelmingly backed Obama. Party ID may supersede age in the general election, but a voter's age may have some part in determining whether age or experience becomes the prevailing view. In the end, age will take a backseat to the economy or the Iraq war, but it is a distinction that could prove consequential in an Obama-McCain general election campaign (especially if the election proves to be as close as it has look in some of the electoral college maps). What are your thoughts? Is it age, is it experience, or does it even matter? The comments section beckons. There were quite a few new polls this past week (plus one day). With 29 polls in 20 different states (and the addition of some backlogged polls in 11 other states), there was as much chance this week for a large number of shifts as we've seen in number of weeks. However, the changes from one category to the next are still confined mostly to the swing states or in states where the number of polls are minimal. For instance, North Dakota moved from being a toss up favoring Obama to a toss up leaning toward McCain based on the addition of one poll to the only other poll in the Peace Garden state (Yeah, I didn't know that was North Dakota's nickname either.). 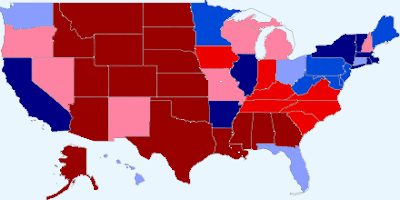 Other than North Dakota, though, there were several changes to the McCain-Obama map. Colorado: The Centennial state continues to look like a fall battleground state by flipping back toward Obama this week. Indiana: The Hoosier state shifted from McCain lean to Toss Up McCain. Michigan: Michigan is shaping up to be a valuable piece of the next president's path to the White House. The Wolverine state had been favoring Obama for the last several weeks, but shifted back toward McCain over the course of the last week. Along with Indiana above, Michigan forms a band of competitive states in a McCain-Obama match up. This grouping stretches from Wisconsin through Michigan and down through and across Indiana, Ohio and Pennsylvania. Minnesota: On the western border with Wisconsin, though, is a state that is going in the other direction. Minnesota is getting less competitive and is now in the Strong Obama category. The North Star state could certainly come back into play if McCain opts for the state's Republican governor, Tim Pawlenty, as his running mate. And he may have to if the state continues to trend toward Obama while proving a potentially valuable 10 electoral votes. South Dakota: Both Dakotas have given Obama some positive poll numbers, but both have been solidly Republican at the presidential level for a while now and have certainly moved back in that direction with the most recent polls. South Dakota had been a toss up state for McCain, but has jumped into the solid McCain area now. While there were changes in the map, there were only a handful of consequential shifts. Michigan's move toward McCain shifted those 17 electoral votes into his column, and in the process, turned a two electoral vote McCain victory into a more solid (Bush/Kerry-esque) 281-257 edge for McCain (with the North Dakota and Colorado shifts). And what about the Clinton map? There was plenty of movement, but the movement was toward the extremes. Blue states became bluer and red states became redder. Pennsylvania got darker for Clinton and Texas fell in line behind McCain as it has reliably for the GOP during recent cycles. The McCain-Clinton map already looked similar to the maps from both 2000 and 2004 and could still end up that way. And those battleground states are largely the same, though, some (most notably Florida, Michigan and Ohio) have switched sides. Clinton would narrowly win the electoral college if these weighted averages reflected how each state will vote just over five months from now. So Clinton does better against McCain and the Democrats have picked the wrong nominee again. Well, yes and no. Yes, the New York senator has a slight advantage over McCain in the electoral college, but it doesn't amount to too terribly much in relation to Obama. As we have seen, just one state (Michigan, for example) can turn the tide. And when we examine the McCain margin (the difference between each candidates margins against McCain in all 50 states), what we see is that neither candidate makes all that much difference. 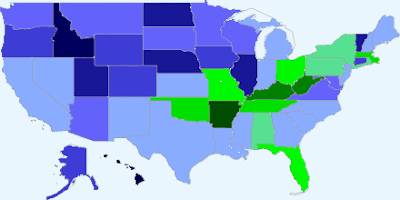 The darker a state is, the greater a difference a candidate makes (green for Clinton and blue for Obama). What we see below is a very light map. There just aren't that many states where one Democrat fares much better against McCain than the other (...that they aren't going to win or lose anyway). For Obama, Colorado, Connecticut, Iowa and Oregon are states he is in a position to win where Clinton lags. Arkansas, Kentucky and West Virginia are those states for Clinton. All three are firmly in the GOP column in an Obama-McCain pairing, but are much more competitive when Clinton is the nominee. While both candidates take different routes to their electoral vote totals, they are both close enough to each other relative to McCain in most of the swing states. Close enough that one state flipping into or out of the Republican total could give either Democratic candidate more than 270 electoral votes. 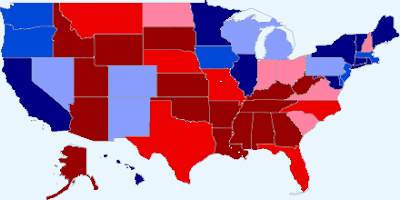 As of now, Michigan, Nevada and Ohio are the most likely to shift to the other side of the aisle on the McCain-Obama map, whereas Missouri is the most likely to shift in the coming weeks (or week if this nomination race comes to a close after Montana and South Dakota) if Clinton were considered the nominee. *I should also note that any and all feedback on the new look maps is welcomed and appreciated. Thanks again to all those who chimed in over the weekend. Reader Feedback Wanted: New Electoral College Maps? Well, Wednesday came and went with no new maps. What's up with that? Personally, I hate letting a day pass without posting something, but I'm not a big fan of shallow blog posts, so I try to refrain from such. What I did do was put some time in on a variation of the old map style that added in the color scheme of the new maps I posted on Sunday. Let me take this opportunity to thank everyone who stopped by and added their two cents (A special tip of the cap in reader, Anton P.'s direction is necessary also. Thanks for the gif editing suggestion. I hadn't thought about--or wasn't willing to take the time on--that.). I think you'll all find that the map below is a much more polished product. I'll let this map stand alone for the time being, but will be back later today with the McCain-Clinton and McCain Margin maps and some analysis as well. The good folks at the Kansas Democratic Party **contacted me this afternoon and shared with me the finalized slate of delegates headed to the national convention from the Sunflower state. The results in Kansas are similar to what we saw in Colorado; namely Hillary Clinton improved slightly upon her Super Tuesday showing in Kansas. If the delegates had been awarded on a purely proportional basis following the precinct/county level meetings, Clinton would have secured just 8 delegates. In the end, she walked away from the May 17 state convention with 9 delegates. What isn't as clear in the Kansas case as it was in the Colorado case, is how big and vocal the Clinton presence in Topeka was. There is at least some evidence to suggest that Clinton's support in Colorado Springs was great compared with the campaign's efforts leading up to and during the precinct caucuses. Is that enough to say that it was the Clinton support that managed one more delegate than expected from the Colorado state convention and not simply statistical artifact? No, but it is more of an indication of that than what came out of Kansas. Clinton was able to round up higher delegate totals in 2 the 4 Kansas congressional district meetings in April. She also rounded up in the at-large delegate allocation at the state convention. In the end then, Clinton's gains appear to be a function of rounding up to the nearest delegate and not of her campaign pressing for support in Kansas two weekends ago. With Kansas complete, six of the 14 caucus states have completed their delegate selection to the Democratic National Convention in August. And there is some symmetry to how things have come out. Two have moved toward Obama throughout the process (Alaska and Nevada), two have stayed put (North Dakota and Wyoming) and two have moved toward Clinton (Colorado and Kansas). Reviews then are mixed as to whether the caucus question hypothesis holds any water. Obama won all six caucuses, but has only managed to increase his totals in one-third of those states once the process ran its course. What does that mean? Well, it could mean that the is an unprecedented campaign. Yeah, but you knew that already. It could also mean that no one has ever done as good a job at coming in second as Hillary Clinton has. That seems like an insultingly back-handed compliment, but it is true. No one that has ever competed and has come in second in a nomination battle has ever been this close. This has just been a close campaign and that has stretched deep into the caucus process as well (deeper than the first step). I'm anxious to attempt to get my hands on some of the past caucus data to see if the movement I've been speculated about in this space actually came to pass (in something other than in anecdotal accounts). That way, we'd at least have that baseline of comparison to be able to put this year into context. *I should have noted this in past posts about the final results from caucus states. The results in the title line reflect the percentage won in the original step of the caucus by Obama. I've opted to use him as the baseline of comparison for a couple of reasons: 1) He has had much more success in the caucus states and 2) In keeping with the caucus question hypothesis, it is the front-runner/presumptive nominee who stands to gain from the results from the precinct level. Topeka – On Saturday, April 12, Kansas Democratic Party Congressional District Conventions elected 21 delegates and four alternates to attend the Democratic National Convention to be held August 25-28 in Denver. Topeka – On Saturday, May 17, the Kansas Democratic State Committee elected 11 pledged delegates, one pledged alternate, and one unpledged add-on delegate to attend the Democratic National Convention to be held August 25-28 in Denver. I've been tinkering around this week with a new map making utility based on the Google Chart API in R (via the Social Science Statistics Blog) and was thinking of switching out the new maps for the old ones. The advantages? More color options. Red, orange and brown just don't cut for the Republican leaning states. Sure that color combination was unique, but it wasn't entirely intuitive in the way that dark red, primary red and pink are. Someone can look at that and see strong McCain states, leaning McCain states and toss ups trending toward the Arizona senator without having to scour a the map for a key. The other advantage is that the "Where Democrat X Does Best" maps can be condensed into one map. With more than six colors at my disposal (the price for using a free, online map utility), it is much easier to show where Clinton and Obama are doing better than the other and by how much. The disadvantages? Well, they are the same here as they are with any electoral college map. The result is typically a lot of red. Every map looks like a Republican landslide. But as I told my son today, "People vote. Land doesn't. Do you recall any dirt walking into the fire station to vote when we were there in February?" "That's because land area doesn't vote." Seriously though, you have a decision to make in this endeavor: use a regular map and have a lot of red (distorting the perception of who has the most electoral votes) or use a cartogram that distorts the map beyond recognition (but makes California look bigger than Wyoming to reflect which state has the most electoral college votes). 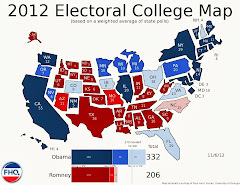 The answer is that you maintain the state shape but expand or contract it in relation to the number of electoral votes. That's something Paul Gurian has been doing for years, but we haven't gotten that up and ready for primetime exposure in this forum yet. By the time of the general election hopefully we will. Here, though, is what I've got now and would appreciate any feedback on. These are the maps with data updated through today sans analysis (There have been a ton of new polls this week so I'll let the weekly cycle complete itself before I fully comment on it). *The darker a state is the more it favors one candidate over the other. A week after Clinton emerged from the Colorado state convention with one extra delegate (compared to her estimated share in the precinct level vote), Obama returned the favor by duplicating his Nevada gain at Alaska's state convention last night. During the February 5 caucuses in the Last Frontier, Obama just missed out on gaining 10 delegates to Clintons 3. The estimated spread then was 9-4. The Obama campaign got just enough more support in the state convention to push that edge to 10-3. Factoring in the superdelegates (plus former governor, Tony Knowles as an add-on superdelegate supporting Obama), Obama will carry a 14-4 advantage over Clinton within the Alaskan delegation to the national convention. The original precinct vote numbers didn't allow either candidate much room to maneuver in Wyoming. The predicted 7-5 split favoring Obama was what came out of the Democrats' convention in the Equality state last night. According to The Green Papers, 4 of the 5 Wyoming superdelegates have endorsed Obama, while the fifth remains undecided. There was no word on who the add-on superdelegate, determined at the convention yesterday, was backing between Clinton and Obama. UPDATE: The AP says that the Wyoming add-on did back Obama and so too did the one chosen at the Georgia state convention. In all, Obama picked up 4 delegates yesterday: one extra pledged delegate out of Alaska, add-ons in Alaska, Georgia and Wyoming. So, Obama gained one delegate this weekend. That isn't a resounding finding in favor of the caucus question. However, the winner from the original step gained through the process in Alaska (albeit slightly) and that falls in line with what we witnessed in Nevada. The lack of shift in Wyoming is similar to what came out of North Dakota's convention at the end of March. Finally, Colorado has been the only caucus state to break with expectations, handing Clinton more support in the final step than in the original one. And the Kansas Democratic Party has yet to confirm the final numbers that I've seen floating around. Up next? Well, Puerto Rico has its primary next Sunday, but Maine holds its state convention and has 24 of the state's 32 delegates at stake. FHQ will be back with more on that one later in the week. The weekend isn't just slow for political news. There isn't much going on by way of delegate selection either. Two of the least Democratic states have state conventions scheduled for today and offer both Clinton and Obama one last opportunity to shift the pledged delegate numbers in Alaska and Wyoming before the convention. In Alaska, all 13 of the state's pledged delegates are on the line. If the convention voting follows the precinct/county level vote, then Obama will walk away with an estimated 9-4 advantage from The Last Frontier. That count is slightly more advantageous to Clinton since she was outpaced in the state's February 5 meetings by a 3:1 margin. Obama may be able to squeeze one more delegate out for a seven delegate advantage. That is Obama's best case scenario, whereas the 9-4 count is Clinton's best but Obama's worst case scenario. According to the party's agenda, that process should be completed by 10pm eastern. Also, as this is the state convention, one add-on superdelegate will be selected. As we saw with Kansas (another caucus state that leaned heavily toward Obama) last weekend, that person is likely to be (but not assured of being) an Obama supporter. Further south and east of Alaska, Democrats in the Equality state are also meeting to put the finishing touches on their slate of pledged delegates to the Democratic National Convention this summer in Denver. Wyoming Democrats selected 7 of the state's delegates at the precinct meetings on March 8. Clinton was able to keep Obama from getting over 64% of the vote that would have given him a 5-2 edge among those 7 delegates. So, even though Obama received over 61% of the vote in the Wyoming caucuses, he only got just more than 57% of the delegates. For the Illinois senator to get anything more than a 3-2 split among the remaining 5 (state convention) delegates he'll need to get 70% of the vote. The most likely result, then, is that 3-2 split which will produce a final tally 7 Obama delegates and 5 Clinton delegates from the state. As with Alaska, Wyoming also has one add-on superdelegate to be allocated at the state's convention. And given the vote spread, that add-on is most likely to be an Obama backer. The delegate portion of the convention should be completed by around 8pm eastern tonight. At the end of the day, Obama may be able to add one more delegate than has been estimated from these two state combined. That would fall in line with the results in Nevada (which was supportive of the caucus question hypothesis: A winner in the original step of the caucus or the presumptive nominee stands to gain as the process continues. Hopefully the results are a bit quicker to emerge from these two states than they were from Kansas or Washington last weekend. From the precinct level to the state convention, Hillary Clinton (ever so) slightly improved her standing in the Centennial state. The initial vote percentages (67%-32 in favor of Obama with 1% opting for "uncommitted") would have yielded a 37-18 delegate edge in a purely proportional system. With the process being filtered through both congressional district caucuses and Colorado Democrats' state convention last weekend, there were opportunities for each candidate to tweak those numbers. Granted, the movement that was witnessed from early February to last weekend could be due simply to the rounding of delegates during each step of the process. As I mentioned in the congressional district caucus post earlier in the week, there had been reports of the Clinton camp making efforts in the state following the initial defeat there. But as the good folks at Enik Rising point out, it all seems too little, too late for Clinton, especially when the alternate delegates are included in the equation (all are Obama supporters). In the end, Colorado will send 36 Obama delegates and 19 Clinton delegates to the Democratic National Convention in Denver. And while this is a "victory" for Clinton in the delegate count, it is certainly outweighed by the much more skewed numbers (favoring Obama) coming out of Nevada last weekend as well. Skewed as Nevada may have been (in the translation from vote totals to actual delegates), the gain Obama got from the beginning of the process in the Silver state to the state convention was the same 1 delegate that Clinton got in Colorado. The result? A wash.
Of course, we're still awaiting word out of Kansas and Washington from last weekend. One blogger posted the results of the 8th district meeting in Washington and another has revealed the breakdown in the 3rd and an Obama slate of delegates to the convention from an Obama site (unconfirmed by the Washington state Democratic Party). By my count, that's 34 Obama delegates and 9 Obama alternates. That 34 is roughly equivalent to the percentage of the vote Obama received in the the state's February 9 caucus. That's 2/3rds of the delegates that were on the line in last weekend's congressional district caucuses. Obama got nearly 68% of the vote in the precinct level meetings. Let's assume for a moment that Obama wins the Democratic nomination, but goes on to lose to John McCain in the general election. Let us also assume that Hillary Clinton is true to her word and campaigns vigorously and wholeheartedly for Obama ahead of said general election. Finally, let's assume that the rules governing the selection of national convention delegates is not altered in any significant way. Iowa and New Hampshire still get to go first, and the rest of the states inch ever closer to a national primary. Would the Democratic Party automatically unite behind Clinton on November 5 following an Obama loss the day before (...or for that matter between then and the beginning of the 2012 cycle)? Whether the party does or doesn't is inconsequential because a challenger (or challengers) would emerge regardless. With Iowa set to lead off the process again (given no change in the rules), would Clinton have a problem in 2012? There has been an awful lot of talk about the caucus process during 2008. But because Clinton's performance was less than stellar in caucus states and because she and her surrogates have questioned the level of democracy inherent in them, would she have a problem in the first and most visible caucus? The Hawkeye takes pride in being the first caucus in the nation; a distinction that allows them to go before New Hampshire each cycle. I don't doubt that Clinton would be more organized in caucus states if she were to run in 2012, but could her stance on caucuses in 2008 give an opponent, say (Sen.?) Mark Warner, an opening in Iowa? As Barack Obama proved, getting off to a good start and proving the viability of your candidacy can be hugely important. Yes, Warner's record and experience speak for themselves and he would potentially be an attractive candidate anyway, but could he (or any challenger) effectively use Clinton's late 2008 caucus position against her? If the economy has rebounded and the Iraq situation has calmed somewhat, then perhaps. But if that is the case, McCain would have a strong case to take to the American electorate and any Democrat (Clinton included) would find it difficult to topple him. If those issues are still the issues of 2012 and if the major Democratic candidates have largely similar methods of dealing with them (sound familiar? ), then the caucus quandary could rear its head in Iowa. The big issue for challengers to overcome would be the idea that 2012 is Clinton's turn. Undoubtedly, that would be a tough mountain to climb. But it looked like a tough mountain to climb in 2008 as well. And then Iowa launched Obama's candidacy. Barring any changes to the rules, though, Iowa will still have the first caucus in 2012. The Providence Journal's, Froma Harrop, ran a column of Clinton talking points this morning. In all the talk (both from her and separately from the Clinton campaign) of all the different metrics of nomination success, Florida and Michigan voter disenfranchisement and the undemocratic nature of caucuses, one thing continues to be underdiscussed in this Democratic nomination battle. The bottom line is that RULES MATTER. We see the effects of those rules in a close race, but also see how adaptable each candidate's campaign is to those rules. Obama's campaign was better at foreseeing how the race would progress. PERIOD. Was that by design? Yes, but to a large degree there is some luck involved there. He had to have all the chips fall in just the right place for that plan to work. So while there may have been discussions within an Obama campaign still in its infancy then about a caucus strategy as early as last summer, they still needed Iowa or New Hampshire or Nevada or South Carolina to help even get his campaign to that point (the caucus phase between Super Tuesday and Wyoming a month later on March 8). Those Obama successes in Iowa, Nevada and South Carolina were anything but given even at the outset of the 2008 calendar year. Foresight and luck are the marks of a long shot winning the nomination. Arguably Obama is not, in 2008, the long shot that Jimmy Carter was in 1976. Both, however, were effective at navigating through the rules of the game. And things worked out the way both campaigns expected; both by design and through some luck. Carter needed early success in Iowa and New Hampshire to set him up for an elimination contest against George Wallace in Florida. He needed that elimination to claim the mantle as the southern (albeit more moderate) candidate in the race for the Democratic nomination. In 2008, Obama needed a win, any win, among the early states to be seen as viable in the overall contest and heading into Super Tuesday on February 5. That he got a win in mostly white Iowa was certainly better than having broken through in South Carolina, where African Americans made up over half of the primary electorate. But his win in Iowa signaled to African Americans that he was viable to an audience broader than simply African Americans. Without that signal, the race may not have played out the way it did in South Carolina. The polls in the state prior to Obama's Iowa win showed a tight race between Clinton and Obama. And even then the endorsement of the influential, Rep. Jim Clyburn (D-SC), was still sought after by Clinton, Edwards and Obama to put any one of them over the top. But it was just before It wasn't until after South Carolina that the strained relations between the Clintons and the black community began to appear. Obama's campaign emerged from both state victorious and proved their knowledge of the rules by gaining one more delegate than Clinton in Nevada, despite losing the popular vote (That knowledge of the rules extended to subsequent steps in the Nevada process as well.). Obama's path, then, was not necessarily a clear one. On the other hand, at the outset of the contests, Clinton's path to the nomination was the clearer one. But luck runs both ways and Clinton had some bad luck. Her campaign leaned way too heavily on the approaches to the presidential primary process of the past. But we all did. Why wouldn't both parties' nominations be settled by Super Tuesday? That's the way it had been in most nomination contests since 1988. [Of course, the Clinton campaign didn't fall back on those approaches enough to take her name off the ballot in Michigan for that state's non-sanctioned primary. That decision was curious at the time given her status as front-runner.] The Super Tuesday or bust strategy was fine, in and of itself, but they never had a Plan B in place if the states that held contests on February 5 didn't hand her enough delegates for the nomination. And they certainly didn't foresee Obama building a firewall in caucus states. The message, as always, is that rules matter. And if your knowledge of them is anything less than full, then you are vulnerable to defeat. The discussion, then, is not one of whether caucuses are democratic, or popular votes should be the metric by which a nominee is determined, or of Florida or Michigan. That's a discussion that can be had by both parties when and if they seek to reform the process between now and 2012. The discussion is about a campaign that thought primary season would go one way and later discovered (the hard way) that they had guessed wrong. 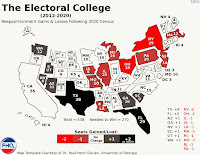 In last week's glance at the electoral college, I argued that once there was more polling data, it would be easier to see whether Obama's post-North Carolina/Indiana inevitability (at least as it was designated by the pundits) had any effect on the electoral college projections. After all, if Obama was inevitable, the expectation would be to see his numbers rise while Clinton's numbers dropped. At the national level, that is exactly what the polls are indicating; Obama's lead over Clinton has risen to nine points. On the state level? Well, the gains haven't been as noticeable there. 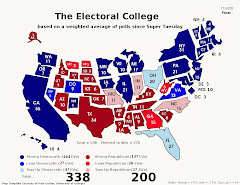 There were 16 new polls this week in 13 states, and the net effect across both sets of hypothetical races was that Washington flipped from a McCain toss up to a Clinton toss up, handing the New York senator a six electoral vote advantage in the electoral college. However, the one caveat to the polling for the week was that Clinton has begun to be dropped from consideration by the polling firms. In three polls (Georgia, New Mexico and Pennsylvania), the Obama/McCain question was asked but the Clinton/McCain question was not. This isn't widespread yet, so the effect of a lack of data in her weighted average against McCain is minimal. When and if this trend increases as primary season wanes, we may begin to see a more static Clinton/McCain map and a more volatile Obama/McCain map (at least in relation to the Clinton map). Though the outcome of the electoral college shifted very little this week, there were some notable changes. To the maps! This week, having Florida, Ohio and Pennsylvania on her side pays off for Clinton. Of course, it took adding Washington's 11 electoral votes to her total to push her over the top. As I mentioned, though, that's all it took to hand her an advantage over McCain, however slight. Again, this looks a lot like the Kerry and Gore maps from the past two cycles. Clinton picks up Florida and Ohio, but loses out in states like Iowa, Michigan, Wisconsin and Oregon. McCain actually holds a forty electoral vote advantage (212-172) among states that are either strongly in favor of or leaning toward one candidate or the other. However, Clinton makes up a lot of ground in the swing states, picking up 100 of the 154 toss up electoral votes (states in purple and brown). Does Clinton increase the number of states where she has a better McCain margin than Obama, though? The only change there is that she adds New York. The amount of difference between Obama and the former First Lady there are minimal, though, as either Democrat is expected to win the Empire state in November. Clinton continues to hold an edge in McCain margin over Obama in the traditional, big swing states of Florida, Ohio and Pennsylvania. The differences in those states are relatively small though (less than 5% in Pennsylvania and less than 10% in Florida and Ohio). Both Clinton and Obama win in Pennsylvania, but Obama comes out on the wrong end in Florida (McCain lean) and Ohio (Toss Up favoring McCain). The McCain/Obama map is largely the same this week. The electoral college outcome is the exact same. McCain edges out Obama by the same two electoral college votes (270-268) that he did a week ago. In the states where they are either strongly ahead or hold a small but significant lead, McCain leads 213-207. Notably, the number of toss up electoral votes continues to drop in the McCain/Obama match up. McCain became more comfortable in Nebraska this week with that state moving from toss up to McCain lean. Among the remaining toss up states, Obama took 61 electoral votes to McCain's 57. The McCain/Obama race is close no matter how you cut it. They split fairly evenly the number of strong and leaning states and also evenly split the toss up states. The interesting thing is that the McCain/Clinton pairing now has more toss ups than the McCain/Obama race; a decided shift from earlier iterations of these maps. While the number of toss up states has dwindled for Obama, he still maintains a higher McCain margin than Clinton in 35 states. However, the map is becoming more and more yellow. And a yellower map means that no matter who the Democrat is that faces McCain in November, the results are largely similar. It just happens that Obama hold the (slight) advantage in most of those states. The result is that these maps show that who faces McCain in November makes no significant difference at this point. The electoral college is close no matter who is paired with McCain and the margins in the swing states continue to converge. Clinton, however, has lately continued to contend that she would be the better general election candidate. That is not borne out here. She is doing better than she was, but she and Obama are in the same position relative to McCain. The pundits calling the race for Obama after Indiana and North Carolina not only hasn't had an effect in states like West Virginia and Kentucky, but it hasn't driven any movement toward Obama on the state level like it has on the national level. At this point, it is not likely that any real change will occur in these head-to-head match ups until primary season is complete. Of course, that's only two weeks away. On to Puerto Rico, Montana and South Dakota. In Nevada there was a pronounced difference between the percentage of the vote both Hillary Clinton and Barack Obama got in the first round of caucuses in the Silver state and the percentage of delegates each eventually got. And while there isn't a full picture of how things shook out in Colorado over the weekend, we now know the delegate breakdown from each of the state's congressional district caucuses. Of the 36 delegates allocated based on congressional district caucuses, Clinton improved slightly upon her initial numbers in the precinct-level meetings; inching up from around 33% of the vote there to about 36% of the delegates from the state's 7 congressional districts. This means that this increase is either a function of the math of the process (ie: dividing the delegates into each of the districts and then the potential for rounding up to the nearest delegate within each) or the reports that the Colorado Clinton supporters were out in full force in Colorado Springs this past weekend have some merit. In any event, Clinton's gains, however slight, go against the prevailing hypothesis that emerged in the recent post concerning how Obama's "inevitability" following North Carolina and Indiana would affect him in the continuing caucus process. Again, we don't have the full picture of the Colorado delegate situation because the 19 state convention delegates have yet to be reported by the Colorado Democratic Party. It does, however, show that unlike Nevada, Clinton made gains in the arena where Obama had done best during this primary season: caucuses. Will that help her make a better case to superdelegates? Probably not. Not with a 10 delegate deficit (13-23) among just these 36 delegates. I'll be back with more when the state convention numbers are posted. Still no word out of Kansas either. Kansas governor Kathleen Sebelius today vetoed a bill that would have established a presidential primary in the state for the 2012 presidential nomination cycle (via Ballot Access News). For the second straight year, then, Kansas' efforts to transition to a primary election came up short. Last year, the plan to create a primary and schedule it on the Saturday prior to Super Tuesday failed to make it out of the state legislature before the session ended. This year's version proposed the same Saturday before the first Tuesday in February date, but was hampered by the inclusion of a provision within the law requiring a photo ID at polling places in order to vote. The quirk in all of this? Well, as I've been pointing out (see here, here and here), scheduling a primary on such a date would violate both major party rules on the matter. At least in terms of the rules as they were constructed for the 2008 cycle. Kansas would have faced losing half their delegates on the Republican side and (at least initially) all of their delegates in the Democratic process. Of course, all this assumes that the same rules from 2008 are used in 2012. With the GOP already advancing one plan aimed at reforming the presidential primary process, it is up in the air as to how the calendar will look four years from now. And that doesn't even include a discussion of what penalties the parties would impose on state violating any reformed rules. The reform process will undoubtedly be arduous enough even excluding the potential sanctions the parties would impose to keep all the states in line. Speaking of Kansas, the Democratic Party there has told me that results from the weekend's state convention should be online some time tomorrow. I'll be back then with an update on how those 11 delegates were allocated. Three cheers for Nevada! At least the Democrats in the Silver state were able to hold a state convention over the weekend and count all the votes in a timely manner (...and avoid Ron Paul supporters shutting things down). Obama ended up amassing 14 delegates to the national convention in Denver to Clinton's 11. In the other states FHQ was tracking over the weekend, well, there wasn't that much to track. In the void, the media reports (or lack thereof in the case of Colorado and Washington) seemed to fall back on the idea that the first step determined the allocation of delegates in those states. At least that was how the reporting on Kansas' state convention went (11 delegates were supposed to be at stake in the state convention phase of the Kansas delegate selection plan.). The focus there was on the lt. governor being named an add-on superdelegate (...and that he was backing Obama). Washington received nary a mention and the focus of the Colorado coverage was the senatorial nomination of Mark Udall. In other news, there are actually a couple of contests occurring tomorrow. Maybe you've heard. Obama drew a huge crowd in Oregon yesterday and holds a slight lead over Clinton in the polls there. The one thing that could hamper his chances is the fact that new voters (a group that favors the Illinois senator) received two ballots (one partisan and one non-partisan). If both are mailed in, only the non-partisan one counts. That could hurt Obama's numbers on the margins. This has gotten a fair amount of media coverage locally in Oregon, so the word may have gotten out. The possibility is still out there, though. Also, CQ Politics has a look at the race in Kentucky up this morning and gives the advantage to Clinton. No surprise there, but the piece does provide a detailed examination of the race in each of the Bluegrass state's congressional districts. A tie is the best they see Obama doing in any of the six districts. Speaking of ties, FiveThirtyEight.com has an interesting look at the potential for an electoral college tie between McCain and Obama in the fall. Beyond that, they go into the rules that would kick in should that tie occur and who would stand to gain from that. Given the shape of things on the congressional level now, the incoming House would give Obama the edge in a such a scenario. I've mentioned this before, but I'll do so again: If you haven't checked this site out yet, please go by and do so. Excellent analysis. Will Obama's Seeming Inevitability Help Him as the Caucus Process Draws to a Close? What started out four months ago as a Clinton win (in terms of votes) ended up as a Nevada victory for Barack Obama in terms of caucus strategy. Obama parlayed a solid January showing in rural Nevada and lower than expected Clinton support at the district caucuses into a three delegate advantage (14-11) over Clinton in the Silver state. All this after losing 51%-45 to Clinton in the first round of the caucuses. Clinton's six point win was not only reversed as Nevada's caucus process progressed, but Obama's perceived advantage was improved upon and solidified coming out of the state convention yesterday. This fits in with the discussions here concerning the caucus question. Under circumstances that can be considered commonplace in the frontloaded period of presidential primaries, a party's presumptive nominee, having wrapped the nomination up early, would gain support in caucuses through subsequent steps in the process. If a candidate effectively wrapped the nomination up during Super Tuesday, for example, and forced his opponents out of the race, they would stand to increase their support in caucus states where the process's first step was held during the competitive phase of primary season. A presumptive nominee gains as turnout among supporters of the withdrawn candidates at subsequent caucus meetings declines relative to their original turnout. We saw this in Nevada during this cycle as Clinton's support in the district caucuses lag behind her original level of support. The nomination race was still active in 2008 though; Clinton had not dropped out of the race. It can be considered a real victory for Obama then, in terms of strategizing about the caucuses and building up support and turning people out on the grassroots level. There were also state conventions in Colorado and Kansas yesterday as well as congressional district conventions in Washington. News has been slow filtering out about the final numbers at all those proceedings (other than Udall becoing the senate nominee in Colorado and an add-on delegate going for Obama in Kansas). Unlike Nevada, though, all three of those states handed Obama decisive victories. In other words, there was not that much room for improvement on the original numbers. However, if Obama had such overwhelming victories in those states, it stands to reason that Clinton's support in those states may be depressed compared to what it was originally. The New York Times ran a story this morning that raised the idea of Obama putting Republicans on the defensive in the South. At issue was what happened in Mississippi's first district special runoff election Tuesday night. The question has been asked in terms of what the outcome (Democrat Travis Childers won in a district that handed Bush over 60% of the vote in 2004.) meant for congressional Republicans, but what does it mean for the presidential race? In late February, The Fix asked a similar question based on the observation that the higher a state's African American population, the more Republican it voted in the 2000 and 2004 elections (Here's my analysis.). Well, that means the South. The Obama campaign has shown the ability to bring many new voters in to the political process during primary season and many have been black. As Merle Black predicted in the Times piece, African American turnout will be high this fall, and that is likely to put the Republicans on the defensive to some extent. Where and how that higher level of turnout makes the GOP work in the region are the real questions. As the FHQ electoral college maps (see links in the right side bar) have shown, Obama's strength in the South is on the periphery: in Virginia, North Carolina and Texas. The further in to the Deep South the discussion goes, the less likely Obama is to do well, despite increased (or historical) turnout among African Americans. Increased black turnout is one thing, but when it is combined with disaffection among white and typically loyal Republicans across the region, things become more troublesome for the Republican Party. If you are the Republican Party now, you have to hope that both Tuesday's runoff results and the prior special election results were just the product of an energized group of Democrats turning out in numbers well above average for two typically low turnout types of elections. This was a high salience, competitive election (and will be again in the fall), though, and that is more ominous for the GOP. When the trend goes beyond just low turnout in a special runoff election and veers off in direction of disaffection, the GOP, on both the congressional and presidential level, will have to spend time in states in which they don't usually spend too much money and effort having to defend. Time and effort expended in the South is time and effort that could be spent in swing states. That, more than anything prove to be the power of Obama's ability to bring more states to the table than does Clinton in the general election. If McCain has to work in traditional red states while Obama works on Florida, Michigan, Pennsylvania and Ohio, that would give the Illinois senator a decided advantage in the general election. As the race for the Democratic nomination has continued into parts unknown (namely April and May), some attention has been paid in this space to the idea that a candidate gains or loses support/delegates as the caucus process moves from step to step. The posts examining the Caucus Question, as it has come to be known, have focused on the second step of these processes in locales like Texas and Nevada. Nothing, though, is official until the state conventions close in each of the 14 caucus states (Texas included). There are 498 total delegates (not counting superdelegates and add-ons) at stake in these caucus states and the actual allocation of 286 of them (57%) remains unsettled. In some states, all (Minnesota) or part (Idaho, Kansas, Nebraska, North Dakota, Wyoming) of the allocations were settled during the first step and only the identity of those pledged delegates remains uncertain until after the conventions. For 11 of the states (North Dakota already held its state convention and Hawaii's delegates are bound by the outcome of voting in the first step. ), there are still delegates on the table, ranging in number from 5 (Wyoming) to 78 (Washington) depending on the state. Will Obama's inevitability (at least in terms of how his campaign has been covered in the media since Indiana and North Carolina last week) affect the delegate distributions from those states. Obviously there is a baseline in place in each of these states based on how the voting in the original, precinct-level caucuses came out. However, as we've seen in Texas and Nevada already (see above), there has been a modest amount of movement toward Obama as the caucus process has moved to subsequent steps. With the exception of Wyoming, Iowa, Texas and Nevada, the other caucus states delivered Obama a 2:1 or 3:1 victory over Clinton. Iowa and Nevada had more candidates involved than just Clinton and Obama, so shifts in those totals as the steps progressed would be expected. By the time of the contests in Wyoming and Texas, the Clinton campaign was aware of and defending against (to some degree) Obama's organizational advantages in caucuses. In the states where he had at least a 2:1 advantage during the first step, there is only limited room for improvement. Starting tomorrow and over the weekend, observers can begin to test whether Obama's status now as the "nearly presumptive nominee" (and you thought presumptive nominee was already too much to include in a title) will have an effect on his delegate totals from the caucus states. Colorado has three more congressional district caucuses scheduled for tomorrow and the state convention scheduled for the weekend with 14 and 19 delegates to the national convention on the line respectively. Kansas and Nevada wrap up their caucus processes with state conventions over the weekend as well. The big prize will be the Washington congressional district meetings, where 51 delegates to the national convention in Denver will be at stake. After this weekend the undetermined caucus delegates will dwindle to 166, over a third of which is accounted for by Texas. After the upcoming contests in Kentucky and Oregon on Tuesday, those remaining caucus delegates may not matter as much if Obama reaches the majority of the pledged delegates, as his campaign is projecting. 20%!?! That's the Bar in West Virginia? There has already been a handful of states that have introduced or signaled that they would introduce state legislative bills to establish and/or move up a presidential primary for the 2012 cycle. Indiana and Kentucky have indicated that their May primaries could coincide with what would be Super Tuesday during the next cycle (should the same rules from 2008 be used then), the first Tuesday in February. The legislature in Kansas (here, here and here) has gone back and forth over the idea of establishing a presidential primary for 2012 and scheduling it for the Saturday before Super Tuesday. And Minnesota has discussed shifting from a caucus system to a primary, but would keep the contest on Super Tuesday for 2012. Arkansas, however, becomes the first state to reconsider their decision to frontload the state's presidential primary for 2008. State Rep. Nathan George has already said that he will introduce legislation next year to move the newly-created, separate presidential primary election back to the late May date that coincides with the state's primaries for state and local offices (via Ballot Access News). Of course, had the Natural state held its primary where it had been since 1992, we'd be talking about Clinton's great chances next week in Arkansas and Kentucky and possibly of Obama needing to come through with a victory in Oregon to hold off a late Clinton charge. Such a move is not without precedence. Arkansas moved its delegate selection back to the same May period for the 1992 cycle after a caucus in 1984 and a primary among the other southern states during the Southern Super Tuesday in 1988. In both instances the benefits of the move didn't necessarily match (or exceed) the costs. Both times Republicans benefited from the move Arkansas made. In 1988, George H.W. Bush used the southern swing as means of establishing himself as the front-runner (and nearly inevitable nominee) while the Democrats split the contests of that day. The 2008 Arkansas primary was an afterthought on the Democratic side because of Clinton's presence on the ballot. Meanwhile, favorite son, Mike Huckabee used his win there combined with his other southern wins on Super Tuesday to cast doubt on McCain's ability to appeal to the conservative side of the Republican Party. In essence, then, the Democratic-controlled state legislature in Arkansas has helped the Republican Party more with its moves (Though, with some potential division within the GOP bubbling below the surface, it could be argued that Arkansas helped to raise questions about McCain, if that division were to become more pronounced. But in a world of quick fixes and instant gratification, that's crazy talk. "Wait for the effects of these things before reacting? I don't think so. Let's move this thing back."). I've maintained in this space before that 2008 is move aberration than anything and that 2012 will offer a return to the past in many respects; rapid-fire nomination decision(s) being one of them. More often than not though, what we've witnessed in the post-reform era is that once a state moves early, it stays early. The jury's still out on what Arkansas will do. Would McCain Have Won Under the Ohio Plan? The Delegate Race: Is Obama There Yet? Kansas is Back in for 2012! But for How Long? 7! 7 Votes in Guam!